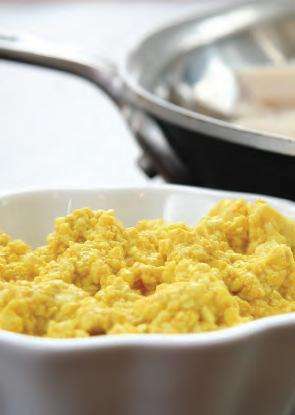 Scrambled Tofu – – Tofu (firm silken), Onion (minced), Soy Sauce, Turmeric, Oil, – Mash tofu in a bowl. Then add your next three ingredients and mix well. Pour oil into a skillet over medium-high heat. Add ingredients from bowl and cook 5 minutes or until warm throughout and light yellow in color.